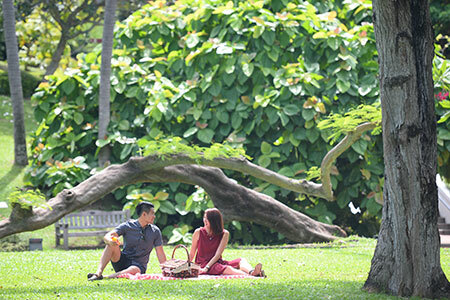 Most people know Fort Canning Hill for its rich history and you may have even ventured to Fort Canning Park to have a picnic or to attend outdoor performances on its green. The 18-hectare park and its surroundings are currently being enhanced with the restoration of three gardens and re-curated heritage trails, among others. But there are still many hidden gems in Fort Canning Park to explore, as I discovered during my most recent visit there. Fort Canning Park spans across 18 hectares, and is one of Singapore’s historical landmarks. It is situated on the top of a hill overlooking Singapore River, serving to protect the island in the 19th century. The Fort Gate in the park is the iconic structure. The Old Married Soldiers’ Quarters (OMSQ) located nearby Fort Gate was built in 1926. It is a small, intimate area which used to house married British soldiers. After Singapore gained independence, the Singapore Armed Forces used this building as an office. There were several other structures erected in this area by the British, including two hospital buildings, but only the OMSQ remains today. It is now a popular location for bands of all genres to hold gigs there, as well as for wedding receptions. One would have never imagined that an old military building would be now used as a popular spot for rock bands and weddings! Married British soldiers were once housed in the Old Married Soldiers’ Quarters. As you walk through the Park, you might also notice a small, rusted gate wedged into a doorway partially hidden by some foliage. On my previous visits to the park, I never really considered what kind of purpose this mysterious doorway would have served. I then found out that this is actually called a Sally Port, which leads in and out of the fort. The word “sally” means to make a sudden, vigorous exit, as it was used to help defenders enter or exit the fort undetected, in case of an attack. According to records, there used to be three altogether, however only this one remains today. Do you know where this doorway leads to? What I had not previously known about the park was that it used to be an important communication centre after the British established a port here in 1819. A map dated 1822 indicated the presence of this flagstaff, believed to be the first communication facility built on the hill. This was followed by a time ball, a lighthouse and a telegraph office. The flagstaff provided important information on the arrival, identity, location and status of ships entering Singapore's harbour. The original flagstaff was made of wood which was later replaced by a steel structure. This in turn was removed by the Japanese around 1943 during their occupation of Singapore. The British erected another flagstaff on the hill after World War II, but it was only used for flying the British flag. This flagstaff was removed in 1959 when a signal transmission tower was built and it was no longer needed for communication. What you currently see is in the park is a reproduction. The flagstaff seen here in the background of Raffles Terrace, is a replica. The original wooden flagstaff provided essential information to ships entering the harbour. The time ball, a replica, was used in the 19th century to signal the correct time to the public. 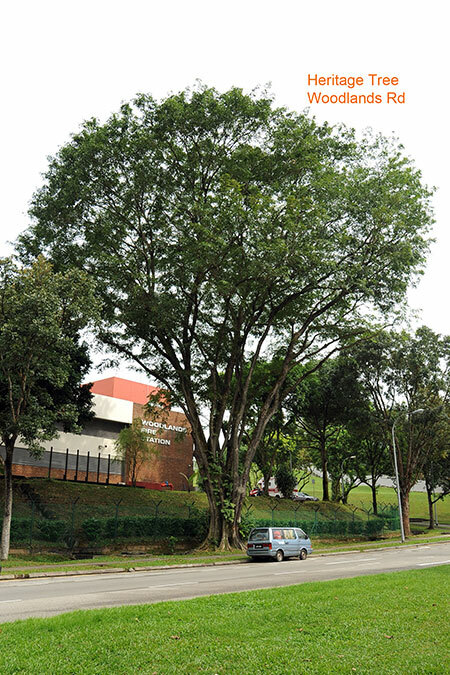 Historically, the time ball on Fort Canning Hill was raised at 12:55 pm and dropped at exactly 1 pm daily, according to standard British practice. This helped businesses, government offices, and residents in the downtown area set their clocks and other timekeeping devices to a common time. In the 19th century, residents in downtown Singapore used the time ball to help keep time. While the current lighthouse you see in the park is also a replica, the original lighthouse was one of Singapore’s most prominent landmarks for ships entering the harbour. With a total elevation of 60 m (made possible by the combined height of the hill and lighthouse), the lighthouse was visible up to 30 km away! The lighthouse was every sailor’s reassurance in the 1900s. It has a range of about 30 km, guiding ships safely into Singapore’s harbour. This lighthouse is a replica of the original which was closed in the 1950s when it was overshadowed by taller buildings. I used to believe that Fort Canning Park only held significance to the British and Japanese during World War II, but little did I know that it was also steeped in history dating back to the 14th century, when Malay Kings ruled the land. Of the many pre-colonial relics found at the park, have you heard of the Forbidden Spring? Also known as Pancur Larangan, it used to be an area where the wife and consorts of the King used to take their baths. No one else was allowed to enter, hence its name. The spring also provided enough drinking water to supply all ships in Singapore harbor until 1830. A body of water, known as “Forbidden Spring”, was said to run through Fort Canning Hill and used by members of the Malay King’s family for bathing. Today, a mural with etchings located near Raffles House describes this and other historical moments of the hill’s past. As part of ongoing improvement works on the park till 2019, the Forbidden Spring will be reconstructed with a water feature and stone murals to depict the significance of water to the site back in the day. In addition to the enhancement works, Fort Canning Centre will be repurposed, where a heritage museum will be installed as well as spaces for new activities, including hosting the main exhibition of the Singapore Bicentennial later this year. Fort Canning Centre will host the main exhibition for the Singapore Bicentennial in the middle of 2019. Visited by tourists and locals alike, Fort Canning Park serves as a timely reminder for us to be ever vigilant to safeguard the security of the nation and to celebrate the successes we achieved. I certainly look forward to these improvements to Fort Canning Park, so that more people can truly experience the hidden wonders of this park more easily. Look out for three historical gardens that are being recreated as part of efforts to restore the rich heritage of Fort Canning Park and its surroundings. As part of the Singapore Bicentennial in 2019, an exhibition will be held at Fort Canning Centre. Also, come to the second edition of Festival at the Fort@ilight Singapore as we celebrate Singapore's rich heritage at one of the most historical places in Singapore. This year's Festival focuses on the life and legacy of Sir Stamford Raffles. Visit the Raffles Terrace, which has a replica of Sir Stamford Raffles' residence in 1822 and explore the newly-planted Raffles Garden on your own. Alternatively, you could join one of our guided tours and learn more about the stories surrounding the magnificent Fort Canning Hill. Currently a full-time National Serviceman, Tan Yong Hui interned at NParks in 2016 when he was a Mass Communication student from Republic Polytechnic. He was a photographer/cameraman covering events and creating content posts for social media as well as website. His enjoyed the opportunity to experience Singapore’s green spaces and introducing them to others through his articles and videos.